The snow has been falling down today. We're expecting more tomorrow. The county was on the ball this morning. They had pick-up trucks with plows on the front out plowing our little side roads. I was happy about that because I didn't want to get stuck anywhere. The main roads were a little slippery at times but not too bad. Must be the new tires. 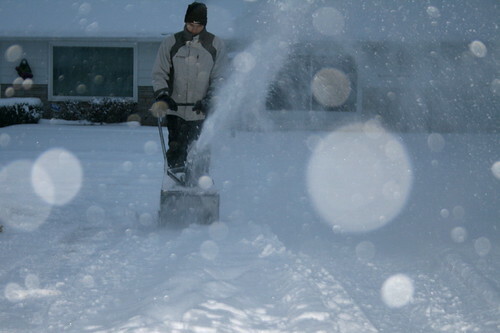 Mickey had to pull out the snow blower after he got home from work. I like watching the flying snow, especially when I know it's not on the driveway anymore.